An all-WA crew combines a range of experience – from Michael Hughes with 13 ‘Hobarts’ through to first-timers including the skipper. Dismasted in early 2017, the boat was re-furbished and fitted with a Halls Spar IRC mast which combined with a Hugh Wellbourne redesigned keel and bowsprit make a competitive offshore package. 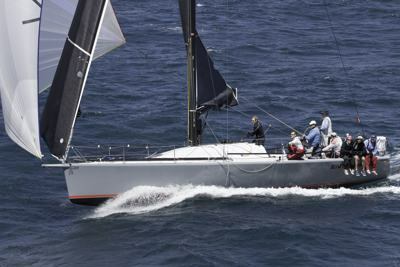 The team has experienced local success with 1st IRC in FSC Success Cup, 1st IRC in Offshore Cup, 3rd overall in the Farrawa Cup, 3rd IRC in Valmadre and 2nd IRC in the inaugural Geraldton to Denham race. “Racing to date has been a lot of fun with great competition within Division two and providing good preparation for the Hobart race. Aim is to get to the finish and be competitive against like-sized boats,” said Kirke.